THANK YOU for praying. More than any month in recent memory, we have seen God respond. Dad sailed through his chemo and is back to life as normal as it ever is these days. Howie is finally “out of the pit” (read his powerful reflections here). A non-event from 22 years ago momentarily threatened to return with a vengeance, God has seemingly swept away into nothing, in accordance with how we and some others fervently prayed. He turned a forbidding Skype call into a time of fellowship and blessing for a missionary friend of ours as a chorus of prayer arose from many around the globe. And He protected even where we hadn’t specifically asked while Donna was flying a glider solo and ended up inverted at low altitude. In the midst of our deep gratitude to God for acting so demonstratively, we reflect on the timing of these things and come away with the overwhelming impression that we desperately need a team of warriors to be praying over the next two months. Back when we did triathlon ministry in South Carolina, Satan tried to separate us so regularly that we began to expect it before each event. In early June, Donna and the girls leave for Camp Cedarbrook in upstate New York to serve as Support Staff Team Lead and more importantly, to do spiritual development with the staff. Last summer the idea crossed Donna’s mind that staff needed to be intentionally fed in a more organized way. With that thought came both a powerful desire to take on that formidable project and absolute assurance that it in no way fits her personality or situation at camp and therefore would never happen. Too hard. Not the right person. Go figure than ten months later, without ever having taken an intentional step in that direction, that is exactly what Donna will be doing at camp. Satan has already shown he is not happy about it. God has already shown that He is, and that He is absolutely in control. Please pray protection for our marriage and communication as we are apart for weeks at a time as well as for wisdom, patience and rest as Donna moves into a task that is truly “God-sized”. We cannot express the value of your coming alongside us in prayer. Please let us know how we can return the favor. Congrats, Ginni! 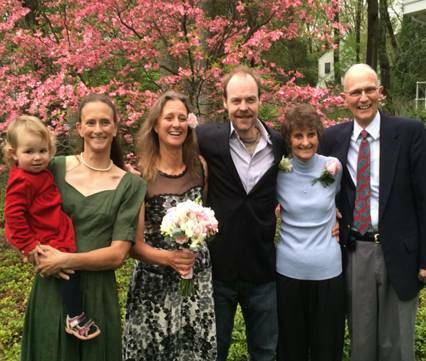 Donna’s sister Ginni married Henrich on 4 May in New Jersey. Gwendi and Mom and Dad also attended. Slick kept Matti (throwing up the first 2 days) and Zoe (throwing up the third day) at home/work with him: “Never again!” he said. Gwendi threw up at Ginni’s reception and on the airplane home. Never a dull moment, these kids!